You can also email us at info@aeroceanetwork.net and we will respond on our next working day. Since 2002 we have been running AerOceaNetwork (AON). We are a non-exclusive group of like minded independent international freight forwarders who want to excel in their markets. At the same time we are building our good name around the globe. Our global forwarding members meet annually to develop their cargo business pipelines and establish personal ties, which quite often even develop into lifelong friendships – another intangible benefit of joining our group of forwarding professionals. We target positive people who run progressive international logistics companies for our forwarding network membership. We aim to stick to that membership profile and build on it for the future. Everyone benefits from this. Before becoming our forwarding network member, prospect applicants are required to provide references of other international freight forwarding agents who they’ve worked with over time. We check these shipping references for financial ability, operational capability, mutual sales development & follow up, and communication skills (both in ability as well as response time) as well as other pertinent information. Only companies who pass this process can be offered membership in our group. 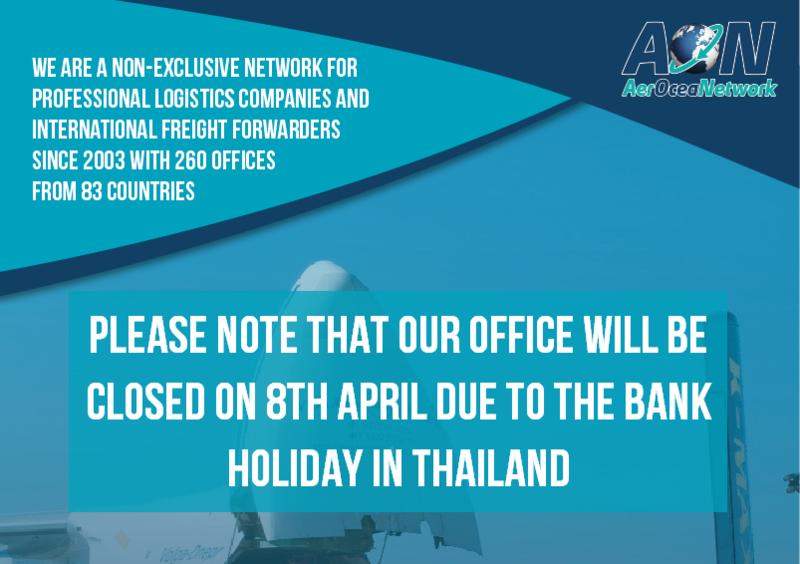 Please note that all our offices will be closed due to Thai New Year Holiday in Thailand from Friday 12th April to 17th April.